Today was a traveling day. Gabriel and I worked late, then around sunrise everyone switched to packing mode, and soon we were off to N’djamena airport. The streets of N’djamena were quiet and calm, and there were no soldiers in sight. Quite a change from the day before. The airport was also quiet when we arrived. Porters in blue uniform were waiting by the road. At the check-in area, the counters had the logos of Air France and other “airlines”: World Food Program and Red Cross. A man went behind to operate some switches, and the weighing machines and conveyor belts came to life. When resources are scarce, people conserve. An International Medical Corps contingent arrived with boxes of medicines. Doctors are always a comforting sight to me, as they must be to many others here. There was a fairly strict weight limit on the UN flight we took, due to the small size of the plane. We were fairly over the per-person allowance :) Thankfully, some seats were empty, along with their corresponding luggage. We sat in the first two rows, right behind the open cockpit – yay, get to hear and see what the pilots do. About two hours of very competent flying later, we were in Abeche airport. There were military aircraft, humanitarian aircraft, soldiers and aid workers. More paper-stamping, then off to see “the owner of the car”. He was quite a character; clearly a sharp businessman. Three cell phones lay on the ground in front of him. A hand-written rental contract was produced, and soon we were on our way east. The road took us through countryside that was desert-like but surprisingly green thanks to the rains. It looked sparsely populated. There were small farms interspersed with a few villages. The villages here look like the those I’ve seen in pictures from Darfur: huts with grassy roofs surrounded by wooden fences. Borders are so misleading. Some of those pictures had been of destroyed villages — I thought, “so this is how they look while intact!” People worked their fields in the shining sun, helped by their animals. The fields were mostly quite small; I wondered if they grew for their own use, or also sold their crops. From how bumpy the road was, tattered in some places, collecting produce for sale would be costly and challenging. You may have heard about our “wadi” experience from Gabriel and Connie. It really looked like a raging river, and if our driver hadn’t been so decisive about traversing it, I think I’d have built up much more apprehension :) Especially since the vehicle before us had got completely stuck for a moment in the middle! But, we charged forth, and thanks to some impressive driving made it across with lots of excitement but little trouble. Note: the video really doesn’t do justice to how it really felt driving through waist-high water! Soon after, we got to our first camp. The security officer was seated with a group of other people under a wooden, open-air shelter. We greeted the people seated. This has been very noticeable, the culture of greeting. Greeting everyone individually when arriving at a place, taking lots of care to greet each other. A number of times while driving both Alis wound down the window to greet someone they recognized. Greetings I’ve heard are: saba (colloquial “How are you?” according to Ali), Alhamdulillah (“Thank God”) and Masya’Allah (“God has willed it”). After greetings, more paper-stamping. I wonder if there is a cultural aspect to this practice of seeking permission, or if it is just about bureaucracy and control. It was my first time in a refugee camp. Kids were out playing and soon after arriving, we were surrounded by little ones saying “ok”, extending their hands, smiling, laughing. We walked a bit deeper into the camp, escorted by them. I was asking them about school, when suddenly a boy showed up with two pens in his hand. I asked if he knew to write English — “Yes”, he said. He wrote something for me in English — “Lesson One”. How apt, I thought :) Another boy wrote “Lesson Two”. I asked if I could write something for them, and wrote “Very good!” in their book. At an intersection of lanes, one of the kids gestured to warn me of what at first seemed like an ordinary hole in the ground. It was an open latrine. 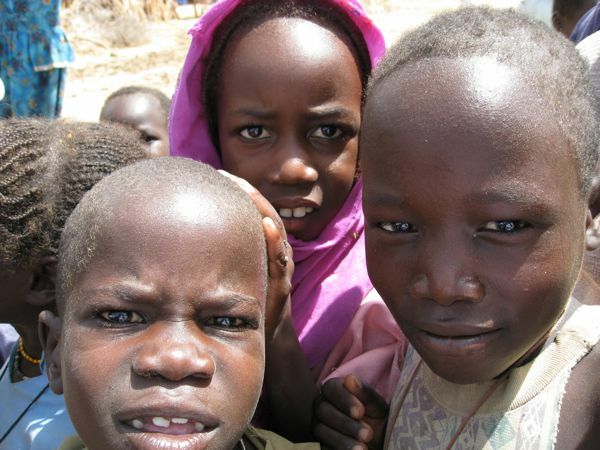 These kids were all from Darfur. The whole time we were there, kids would occasionally ask me for a ball, a pen, a book to write in. I told them that I didn’t have, and was sorry. I felt very helpless. These were hardly unreasonable requests. Why should any child not have a pen or a book to write in? Over time I have become quite uncomfortable with the excesses of life in the more “developed” parts of the world. This experience was crystallizing; the effect of resource misallocation in pure and simple form. How can it be conscionable to buy an expensive car, house – anything expensive – when the difference in price between it and something cheaper (but with the same functionality) could go directly towards balls, pens and books for kids like the ones we saw today? The price of a good reflects the value of every tangible item that went into producing that good. So excess at the point-of-purchase results in excess all the way to the raw materials. The purchasing decisions we make affect the welfare of beings far and wide.